Been noticing this book on the floor at Eliza’s house ever since we started Brain Rug practice there. Camus whatever but that cover design is naice! She allowed me to whisk the book away for a time. I may read it but I’m more likely to stare at the abyss on the cover and let it staaare riiiight baaaaack. 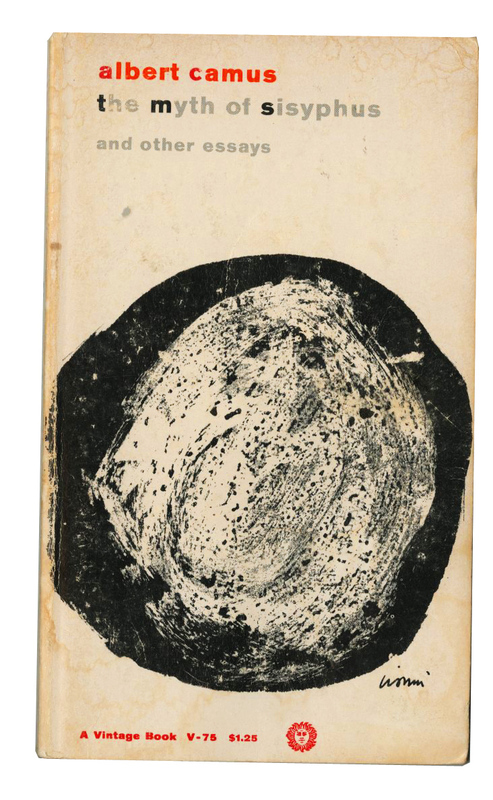 I had that book (albeit with less awesome cover) and it was not great–I’ll pass on a Camus essay any day of the week. A cover can’t be judged by its book. Alright, so I have one vote for reading Camus and one vote against. I need a tiebreaker. that’s funny, i think i got one of these at powell’s for like a quarter for a friend and some guy stopped me to tell me it had the most profound influence on his life and he loved it and was so excited someone was getting it. I think Camus’ novels are much better, though. YES VOTE. BUT FOR NOVELS.